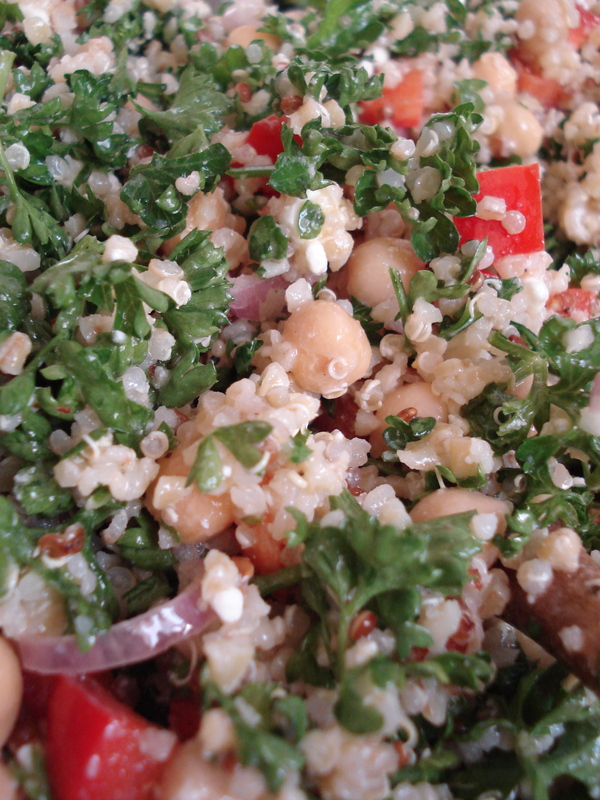 Whenever we have a picnic, I make tabouli salad. Each time it turns out a little different (depending on what ingredients I throw in). This particular recipe (featuring fresh bell peppers) is one of my favorites and probably the one I make the most often. The red and yellow organic bell peppers that I buy at our nearest farmer’s market have just been so good lately. I haven’t even wanted to cook them. They have their own sweet flavor and can easily be eaten raw. 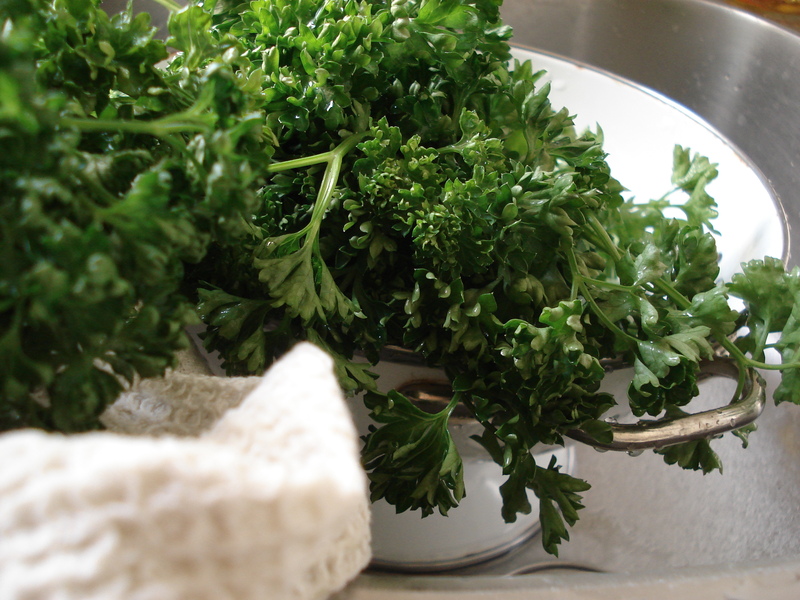 I’m also on a parsley kick and find that a tabouli dominated by it (rather than by grains) is much better. 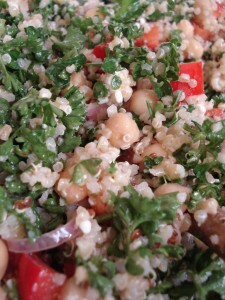 I used to put in a lot of bulgur and only a little parsley – lately, I’ve been doing the exact opposite, and only putting in a small portion of grains. That’s the great thing about making tabouli – you choose the ratios. In this version, the dominant tastes are parsley, bell peppers and lemon – lots of lemon. I’ve also been playing with the type of grain I put in. 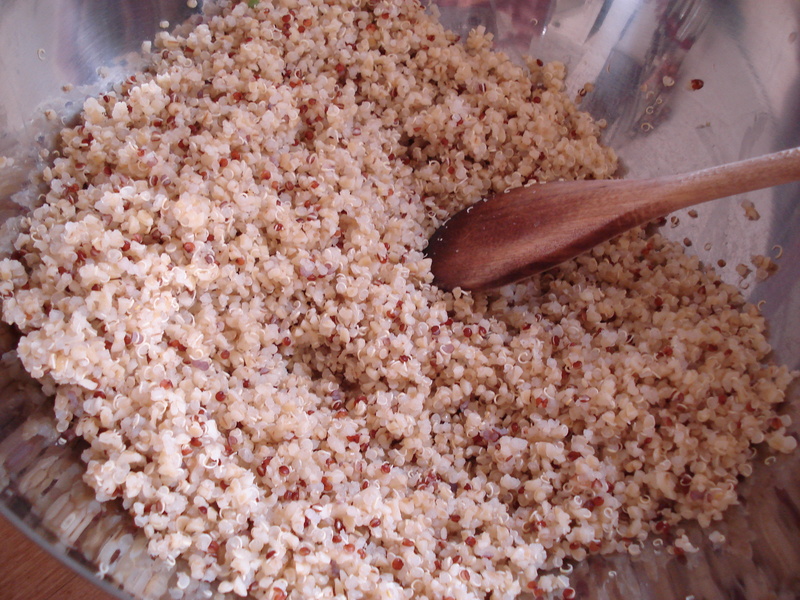 My favorite so far is a combination of both bulgur and quinoa. 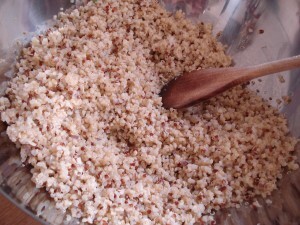 Straight bulgur, I’ve decided, makes the salad too heavy for summer picnics. These ingredients are just to give you a rough idea. I don’t actually follow them, but let the salad tell me what it wants! 1. Cook the grains and set aside to cool. 2. Prepare the other ingredients and mix them together in a big bowl. 4. Sprinkle with olive oil (copious), a dash of vinegar, lots of lemon juice, salt and pepper. Just keep tasting and adding until you’re satisfied. 5. Pack in a box and refrigerate. It’s ready for a picnic. *For a gluten-free vegan version, use only quinoa and leave off the feta. This entry was posted in Recipes (All), Recipes (Gluten-free), Recipes (Vegan) and tagged salads. Bookmark the permalink. 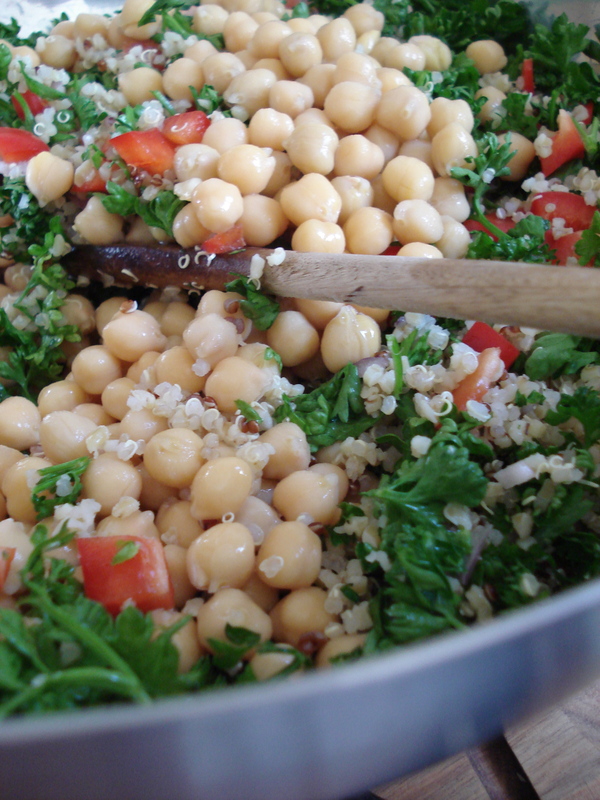 Can we have a picnic this weekend and you can make a taboulé? I’ll make something fresh and summery…with my NEW kitchenaid mixer! There’s nothing like a new kitchenaid mixer! What color??? 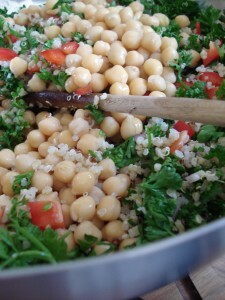 I think I’ll add some couscous to the tabouli this time. Three grains for three times more fun.